Austrian police on Monday fined a French businessman under a controversial face-covering ban. Algerian-origin Rashid Nekkaz became the first person to be fined under the law, which came into force on Oct. 1 despite objections from Muslim groups. 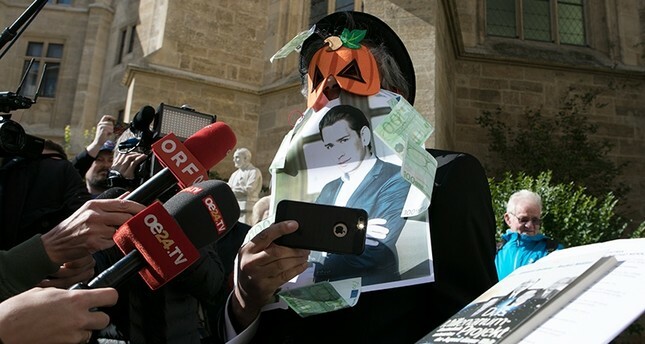 Nekkaz covered his face with banknotes and photos of the country's foreign minister, Sebastian Kurz. Protesting against the ban in front of the foreign ministry in the capital Vienna, Nekkaz said women should have the right to wear whatever they want. He also demanded a meeting with Kurz. Police later took Nekkaz into the ministry building and fined him €50 ($58). Nekkaz told journalists after his release the law was "disgraceful" for Austria. "I think you should change this law as soon as possible," he said. The law -- which prevents people from concealing their face -- applies to all public places, including transport facilities, and police have the power to demand the removal of concealing veils. Those who refuse to comply may be taken to a police station, a ministry statement said last month. Austrian lawmakers passed the ban in May, despite the tiny number of Muslim women in the country who sport the face-covering burqa. Those opposed to the legislation say the ban is discriminatory.